Kansas City Chiefs Wide Receiver De’Anthony Thomas’ has always been a standout player. Those who witness his running ability can’t deny his greatness. At a young age, his speed turned the heads of many people, even Snoop Dogg. Eleven years after being ordained as the ‘Black Mamba,’ Thomas performed in front of his home crowd as an NFL player. He entered in the game during the third quarter, ultimately receiving two passes for 13 yards. Thomas played in the Coliseum before his years as an Oregon Duck, when he was a Crenshaw Cougar. With the help of Thomas, the Cougars won the City Section championship in 2009 and 2010. Thomas took the Crenshaw Cougars to the state championships two years in a row. In 2009, Crenshaw fell to De La Salle 14-28 after Thomas sustained an ankle injury. However, they rallied back the next fall with a 12-2 record during the season and the City Section playoffs. Crenshaw was ranked 19th in the state and 153 in the nation during the 2010 season, according to MaxPreps. At Oregon, Thomas earned 1,424 rushing yards and ran in 20 touchdowns. He also racked up 92 receptions, 14 of them leading to touchdowns. Thomas decided to attend Oregon allegedly after visiting the campus. Some believed he would attend USC. Now, Thomas is in his third year as a Chief with 40 career receptions for 296 yards. He suffered from a concussion last November, but got playing time in the preseason. Thomas made three receptions for 46 yards, leading the team in receiving during the Chiefs’ preseason debut. On Saturday, Kansas City was ahead 13-7 at the half; Spencer Ware ran in the first touchdown. However, the Rams rallied back in the fourth quarter. The Chiefs did not score in the second half. Quarterback Jared Goff threw the ball to running back Malcolm Brown who ran the ball into the endzone, giving the Rams the lead 21-20. 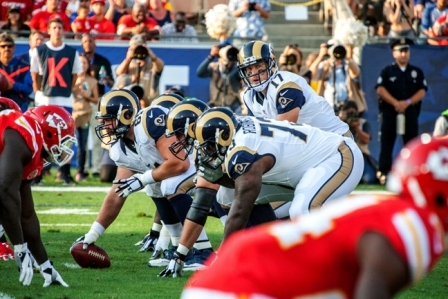 The Rams will battle against the reigning Super Bowl champions, the Denver Broncos on Saturday, Aug. 27 at 6:00pm.